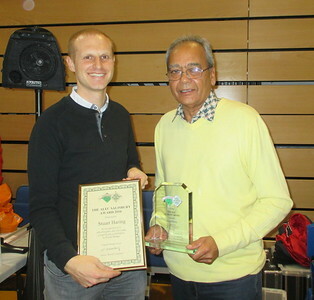 This award is presented in memory of Alec who was a teacher who gave much of his time to promoting junior bridge. It is given to a serving school teacher who has made a significant contribution to schools bridge. The award is made jointly between the EBU and English Bridge Education & Development. 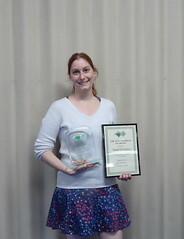 Deb has been the driving force behind the minibridge club at Claremont Fan Court School for around 14 years. 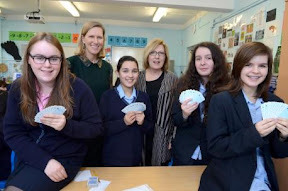 During that time the bridge club at CFCS has consistently thrived, and they have sent significant numbers of children of that age range to represent the school in Surrey's junior event, the Surrey Schools Cup. Indeed, they have also been successful, CFCS providing winners or joint-winners in the MiniBridge section in 2005-08, 2010, 2014 and 2015; and in 2018, though none of their pairs won, the school sent 11 players to the competition, the largest MiniBridge entry from any school. In 2017, CFCS introduced the teaching of bridge, via MiniBridge, to the academic curriculum, with Deb at the helm. This is a significant move for bridge in England and, to the best knowledge of Surrey CBA, a first for Surrey – though some schools in Surrey have taught bridge as a one-off initiative, no other school has made it a permanent part of the curriculum. Deb's commitment, enthusiasm, and firm but fun teaching of the game continues to enthuse these very young players, who in turn introduce and encourage their friends and classmates, creating a new generation of players in Surrey. Sarah has been a positive influence on junior bridge since she was a member of the U26 squad and becoming a chemistry teacher. After the announcement of the new U16 category, Sarah was the person who took up the challenge to organise the young players from all across the country to form the first England squad in this age group. Despite its hasty beginnings, this group performed brilliantly and managed 4th in their first ever Junior European championships, qualifying them for the World Championships the following year in Italy. They then managed a creditable 8th place finish despite having lost several members of their team from the previous year and having to field a more inexperienced side. Since its tentative beginnings, the U16 squad has now gone from strength to strength and become a beacon for young players everywhere in the country and that stands as a testament to her efforts. Sarah also has been active within her school, starting up a bridge club which has proved very popular with the pupils and has been a big supporter of the development of the Junior Award scheme being one of the key sources of feedback and critique during its inception. Stuart is bridge master at Haberdashers' Aske's Boys' School, Elstree, and the school bridge team has won the Schools' Cup for the last seven years. He is also involved in helping to develop junior bridge locally and is building links with other schools and their bridge clubs as well as preparing juniors for joining the England squads - a number of his pupils have played in junior international events. Some of Amy's pupils collect the award from Jeremy Dhondy on her behalf. In 2008, the EBU started working on introducing Minibridge to Primary schools across the country. Cindy was one of the first teachers to take up our offer at Pembury School near Tunbridge Wells, Kent and introduced Minibridge to many of her pupils. Since then, Cindy has been a great supporter of our Minibridge initiative and of the EBU Youth & Education Trust. •	attended a meeting of the all party parliamentary group for bridge to discuss why Minibridge was good for her school. •	worked on a document linking Minibridge with the National Curriculum - which successfully helped us to promote the game to more schools and Parliament. The English Bridge Union has awarded Mary Mills the Alec Salisbury Award for 2011 in recognition of the outstanding service she has given to the development of bridge at her school: Nottingham High School, over many years. Mary has been teaching maths at Nottingham High School (an all boys independent school) for over twenty years. Mary first started playing bridge with friends as a student at Nottingham University. However, it was not until Mary started teaching at West Bridgford comprehensive in Nottingham and became involved in a team of 8, that Mary got a feel for what the game was all about. At Nottingham High School, Mary assisted by her colleague John Allen, runs a lunchtime bridge club. The bridge club meets three times a week and numbers vary from eight to twenty boys playing. The club is open to all age groups and beginners. Nottingham High School bridge club have had a team in the Notts team of 8 evening leagues. This has been a valuable experience for the young players over the years and has given them a good insight into competition bridge. More recently the players have practiced on line. The school also runs a two week House Bridge Competition and takes part in various simultaneous pairs events. Over the years, the school has achieved success at the schools challenge at Loughborough, winning the Schools Cup ,the Harry Scully Trophy and this years, Schools Plate. The award was presented by Graham Jepson in front of many of Mary’s bridge students. The English Bridge Union has awarded Richard Croot the Alec Salisbury Award in recognition of the outstanding service he has given to the development of bridge at his school: Hereford Cathedral School, over many years. Richard Croot was initially taught rudimentary bridge by his father at the age of six, which was followed by lessons from his maths teacher at Fettes school. His passion for bridge continued whilst studying at the universities of Bristol and Durham and in the past few years Richard has represented the county of Herefordshire. He has been teaching bridge at the school since 1995 and has seen a number of his pupils go on to England junior success. Richard has also entered his school teams into the Herefordshire county leagues and the Hereford bridge club competitions. At the moment Richard teaches bridge to his Year 7 classes and plans to set up an after school bridge club in the next academic year. 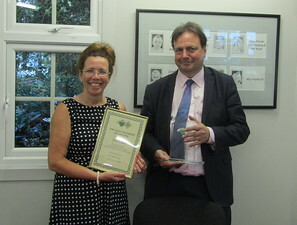 The award was presented by EBU Chairman, Peter Stocken in front of many of Richard’s bridge students. Please click here to view the photos from the day of bridge.